It is not often that a car can claim to have shaped history but the historical importance of a distinguished Daimler appearing on The Grand Avenue at the London Classic Car Show (15-18 February) should not be underestimated. 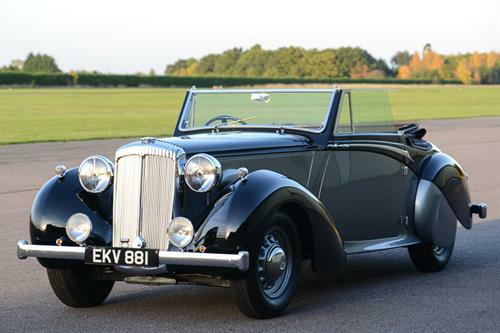 It is not only the sole surviving pre-war DB18 Drop head Coupe but, more significantly, also the very car used by Winston Churchill for his political campaigns between 1944 and 1949. As he toured the country, Churchill would sit on the rear deck addressing packed crowds via a loud speaker system fitted on top of the car’s bonnet. The DB18 was deemed appropriate as its relatively compact size ensured the huge numbers packing the streets could have a good view of their national hero. As currently depicted in the Oscar nominated Darkest Hour film, Churchill was without doubt one of the most inspirational and charismatic leaders in British history, and during the Second World War the driving force against Nazi Germany. This extraordinary Daimler played its part, too. Announced in 1939 just before the outbreak of hostilities, the DB18 was the ultimate version of Daimler’s famous Fifteen model. It was the first Daimler to boast independent suspension and was powered by an enlarged, 2,522cc version of the overhead-valve six first introduced in 1933. An initial production run of 23 Drop head Coupés was planned for 1939, but production was soon halted when war broke out and didn’t resume until 1945. Adding to the disruption, only eight of the original cars had been built when Daimler’s factory was destroyed during the Blitz of 1940 and five of those were destroyed during the attack. Today only one of the surviving three DB18s exists: chassis number 49531 – Winston Churchill’s car with its unique Carlton Carriage Company designed drop head coupe body. The remarkable machine has just been returned to its former splendour having undergone a major £120,000 restoration and now joins more than 50 of the world’s finest automotive creations parading up and down The Grand Avenue runway, the central feature running almost the entire length of ExCeL within the expanded The London Classic Car Show. “This very special Daimler not only has enormous provenance in the classic car circles as the only surviving DB18 Drop head Coupe but is also a car which played a major role in shaping the history of this county and, indeed, the world – it ticks all the boxes,” said Bas Bungish, Event Director.